Take a leisurely stroll through the fragrant Palm Grove. 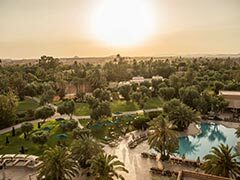 The Club Med Resort, set in Morocco's oldest palm grove, reflects the intimate aspect of the medina, with its beautiful gardens, refined cuisine and warm welcome. The local architecture combines brick, tadelakt, pisé, red ochre and colourful zillij tiles, to create a relaxing haven to welcome you after a stroll through Djemaa el-Fna Square or the medina. 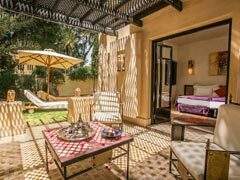 Discover Le Riad, the 5Ψ Luxury Space within the Marrakech La Palmeraie 4Ψ Resort. 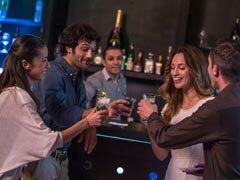 An ideal choice for those who want to combine privacy, privileged, customised service and luxury comfort, with the warm and friendly Club Med spirit: A private, exclusive space comprising a dedicated pool and bar. 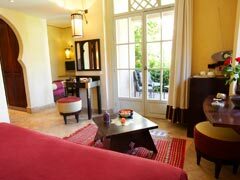 Luxury accommodation comprising Suites with private terrace or garden. Privileged services: room service for breakfast, champagne in the evenings(served by the glass,from 6 pm), concierge service, etc. Unlimited access to the activities and services at the 4Ψ Resort. Resort with 300 rooms in the heart of the Palmeraie (palm grove), all located in traditional-style bungalows with one upper floor. The bungalows are grouped around an ornamental pool with small fountains and flower gardens. 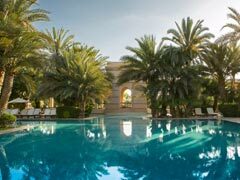 In the heart of the palm grove, Le Riad 5 Trident Luxury Space is a haven of peace and serenity, with 60 Suites built in the spirit of the local architecture, with private terrace or garden. Opt for a pleasant Club Room looking onto the gardens or pathways. 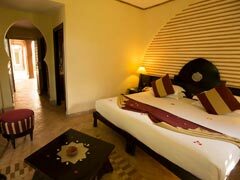 This comfortable room with lounge area is decorated in the Moorish style. The Garden Suite is the perfect way to enjoy Marrakech, with a shady garden to keep you cool. A spacious, comfortable and refined environment, ideal for relaxing. Located on the ground floor. A large, private, tree-lined garden, 80 m² (860 ft²), and terrace furnished with table and chairs and deckchairs. You may like to try the Terrace Suite with its furnished terrace on the 1st floor, or interconnecting Suites, for an even more spacious alternative. Perfecting your strokes at the driving range or playing one of the golf courses at the foot of the Atlas Mountains. Seeing your children play at explorers in the mini Riad inspired by the desert caravans. Enjoying Moroccan hospitality and specialities at the El Kebir restaurant. Chilling at the CINQ MONDES Spa or discovering the souks of Marrakech or the Gardens of Majorelle. Enjoying the privacy of the 5 Tridents Luxury Space in your Garden View Suite. Enjoying your favourite horseriding sport. 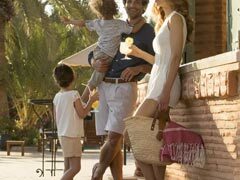 With the benefit of over 40 years’ Club Med experience behind it, our Resort proposes innovative clubs for children and teenagers: Dedicated areas specifically designed for their needs, and equipment designed with a view to comfort and safety. Design inspired by the local environment with its flora and fauna, to introduce the children to the pleasures of living in harmony with nature, and satisfy their curiosity. The children's clubs at Marrakech la Palmeraie have a herb and vegetable garden and an olive grove. Designed like a mini Riad with its own swimming pool, the walls are adorned with oases and caravans travelling through the desert, troglodyte caves and the famous medina. G.O®s with a passion for their job. Numerous activities for all ages: sport, creative activities and games for the different age groups. Opening hours that allow parents to make the most of their stay, and respect the children’s desires and sleeping patterns. For information: the children’s clubs are open all week, except Saturday. In France, G.O®s with a BAFA (State diploma for youth group leaders) or childcare qualification, depending on the age of the children; in other countries, an equivalent local diploma or relevant experience. Activities included: Archery School, Flying Trapeze School with circus activities, Fitness School, Golf School, Tennis School, Mountain biking School, Badminton, Basketball, Volleyball, Tennis, Mini football, Fitness walking, Cardio and weights room, Aquadynamic, Main swimming pool, Quiet swimming pool, Pilates. Activities extra charge: Horseriding, Golf (green fees & courses).